September 11, 2001, this gentle lullaby reminds us that we are never alone. Perfect to share with anyone who feels separated from someone they love. After September 11, 2001, my heart ached for all those children who lost their parents...and for all those parents who lost their children. As a mother, that is one of my greatest fears-to think my children will be without me. As a professional harpist, I use music to express my feelings, so one October evening I was playing a new melody on the harp. Our two sons named the melody, I Will Always Be With You then went to bed. My heart opened and the words came. In 15 minutes the song was complete. It was so simple...yet it said everything. Please consider sharing this simple gift of love with children hospitalized or going through medical treatment, military families separated from their loved ones, parents of newborn babies, patients and family member experiencing grief, or anyone you feel who would benefit from feeling connected with others. We Love It !! Really helps our patients relax. This CD can touch the heart of anyone who has lost a loved one under so many circumstances, from the tragic loss to the loss of an aged, sick parent. The thought that the lyrics convey is so reassuring. The music is so soothing and beautiful. What a wonderful blessing and ministry to those who grieve. Listening to this Cd is hautingly beautiful, soothing, and meditative. Amy, a professional harpist, has a unique gift in the way her music touches that deep place within each listener. 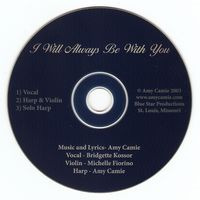 Now accompanying her music is her fully illustrated book of the same title,"I Will Always Be With You." Although children will love the words, music and illustrations, this is a book for all ages. It makes a beautiful gift for that someone special, young and in-between. The words and music combined bring a special quality of deep peace and a feeling that out there somewhere, somebody will always love you. I have listened to your song over and over. Each time a tear comes to my eye even tho I already know the words and what is being said. This was a gift from God to you. The words touch the inner being of all who listen to it. It absolutely has the ability to heal and express a love that is pure and sincere. Thank you for sharing this with us. What a beautiful melody and lyrics! I was amazed when I received the CD in the beautifully illustrated book. I was also moved by the inspiration behind the writing, "written as a lullaby for the child in all of us after September 11, 2001." The song on this cd has helped me through a family death and I sent one of the cds I bought to a family who has two small children whose dad just died from cancer at 30 yrs old. This cd is a gift from god...and very, very moving.